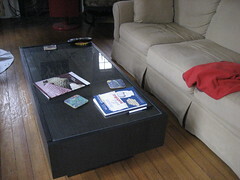 It’s a hair lower than our old coffee table, so it’s a little more comfortable for me to put my feet up on it, and it has more mass than the old table, which makes the scale better for our living room. The best part though? The secret drawers on either end, one for me and one for Mike. 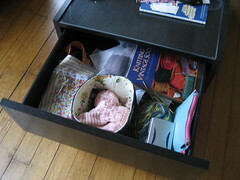 Mine has plenty of space for all the knitting stuff that used to sit on top of the coffee table. 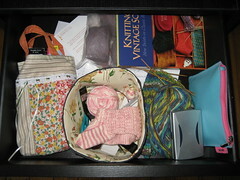 The little tote bag on the right was a gift last Christmas from my friend Katie, and it’s the perfect size for my knitting needles. She also made the little fabric bin that’s currently holding a sock project. Pattern books, my knitting tool kit, my new favorite knitting tool (the extremely fabulous Polder Pocket Scale, perfect for measuring how much yarn is left in a skein) — it all fits like it was born to be in there. I love it.